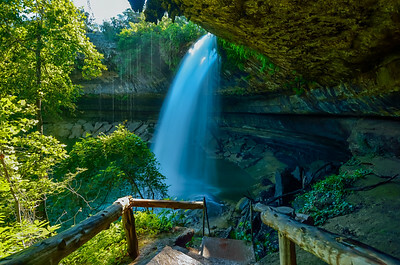 View of the waterfall at Hamilton pool, from the top of the metal stairs. The stairs that are almost always wet. The ones you are very careful on until you reach the bottom. Then you gaze up at the ferns hanging from the grotto ceiling above. 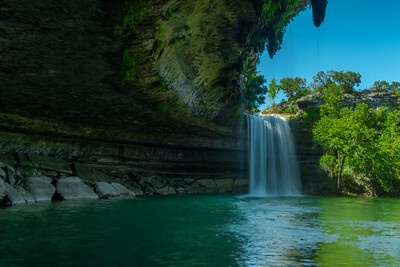 Hamilton Pool Nature Preserve: May 2015. 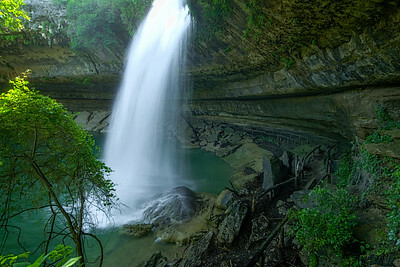 After several days of heavy rainfall, there was enough water flow from the creek above to help create this cascading waterfall. Of all my visits to the preserve, I can say that I never remember it being any greener and fuller than on this visit.